Corry Kamachi and Wildwind Boats are back on the water big-time with a new, rather fantastic catamaran: the Wildcat45. The boat’s inspired by that ultimate in speed sailing, the America’s Cup 45. As most sailors know, the 34th America’s Cup is on track to take off next year in San Francisco, where race teams will compete aboard huge, high-tech AC-72 catamarans. 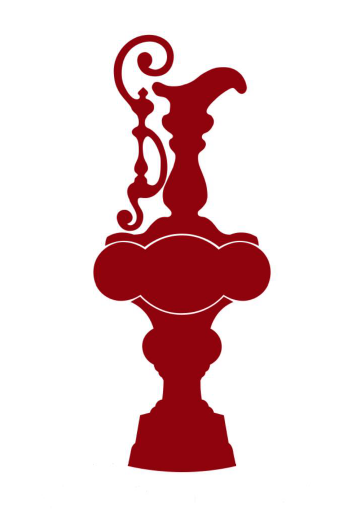 Before that final shootout takes place however, a two-year regatta series is underway using reduced-size AC-45 boats. OK, I use the term “boat” here somewhat advisedly; I’m not talking about the dinghy your mom sails to church on Sunday. The AC-45 is different; it’s a super-speed-extreme, water-based, wind-powered platform. It’s more like something CERN would sail to near lightspeed in the Large Hadron Collider, and then smash to study the quarks emitted. Ok, I admit that video uses edited clips to make a point. I also agree there is huge excitement, history, and spectacle associated with the Americas Cup series. This is the absolute ultimate contest of no-holds-barred sail power. The global significance of the AC regatta and the mythic stature of the AC yacht designs raise a high challenge to virtual boat builders. Not many have the skill, street-cred, and frank audacity to bring this kind of boat to Second Life. Luckily, Corry Kamachi and Wildwind are at the top of the list that do! Corry’s built boats in SL for several years under the Wildwind label. She’s primarily focused on contemporary, hi-tech race boats and she’s had her eye on the AC 45 for a long time. Well sportsfans, that new Wildcat45 just hit the water, and its pretty fantastic. It’s the big catamaran many SL racers were wishing for this past year, and frankly it’s a good deal more. Let me fill you in on just a few of the details. The physical design and dimensions of the Wildcat45 very closely match the real-life AC 45 Rule. 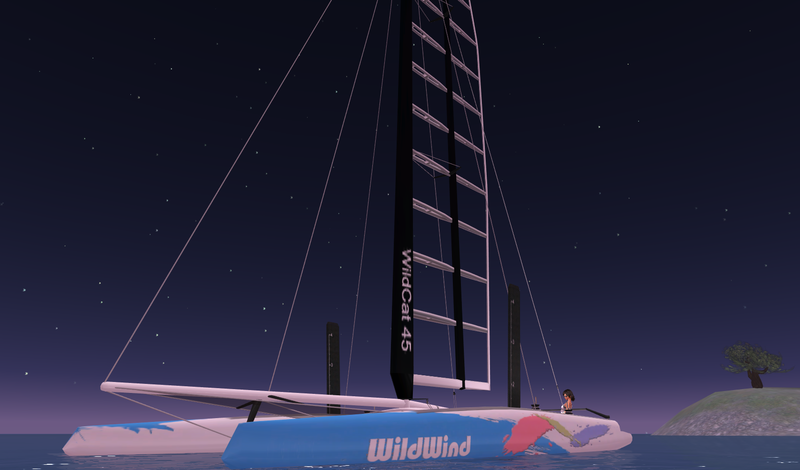 Go look at the America’s Cup blueprints, then grab a tape measure and walk around the Wildcat45 in Second Life; it’s impressive. The craft work and care that went into this realistic build is evident, from the towering sail rig down to the tiny details. When you open the Wildcat 45 v1.0 box, you’ll actually find two versions of the boat included. They superficially look the same, but one is mesh and the other is sculpted. Although there are major advantages to mesh construction in SL, most sailors know that Second Life is having difficulty updating the grid servers to support mesh vehicles. Wildcat45 acknowledges this problem, and gives you the best of both worlds. The box also includes detailed notecards about the boat’s operation as well as instructions about adjusting settings and textures to fit a sailor’s personal preferences. The options are full-featured; you can set the com channel, the operation mode, the sheet-step size, and adjust the sit and cam positions. If you want to change the boat’s textures, there are several subfolders that include templates for the hull, sails, and rigging. There are also specific UV maps and sculpti textures that should give experienced sailors everything they need to pimp their ride. Most of my comments apply to the mesh construction version; I’m guessing in a month or so that will be the version sailors prefer. 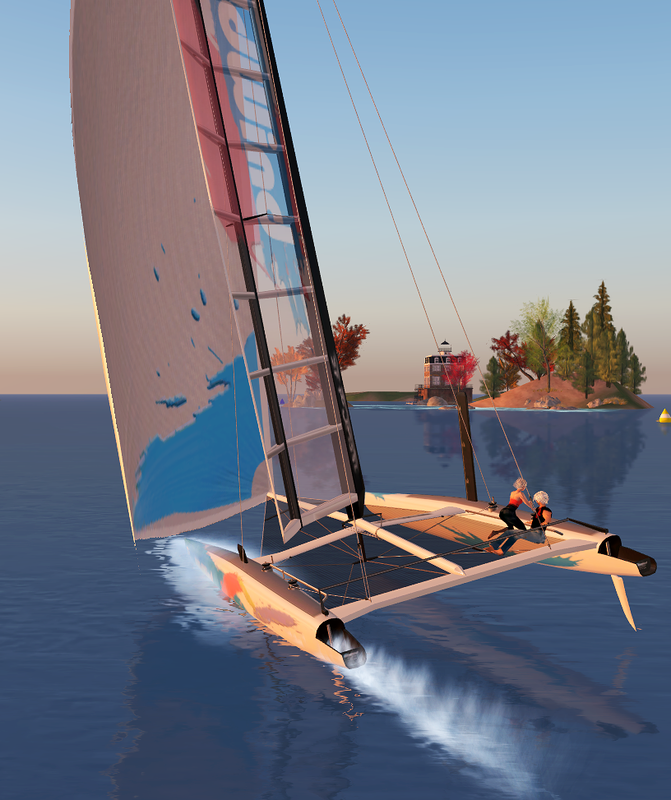 A few days ago I commented about a new realism that’s emerging in SL sailcraft, partly due to mesh construction. SL vessels are evolving an ever-closer match to their real-life counterparts, and the Wildcat45 is a great example of this trend, in both appearance and performance. The boat has two symmetrical hulls , with all the hardware and rigging you would expect from the real boat. 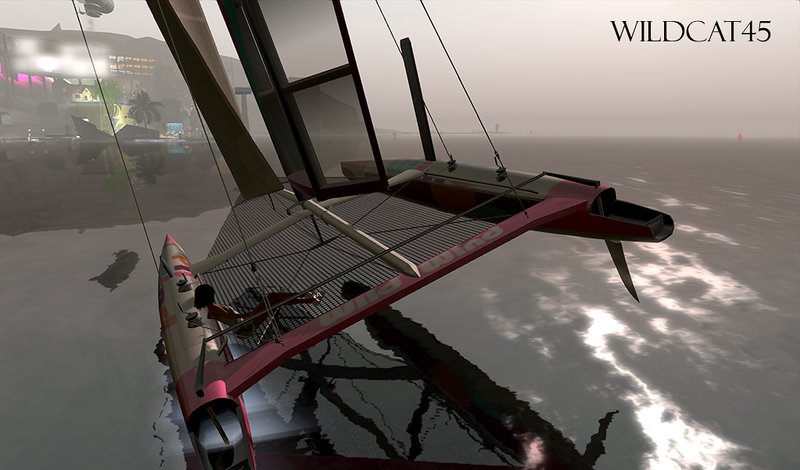 Collision tests with Wildwind45 show that “the boat you see is the boat that bangs into things” (that’s good). However, the mast and sails are phantom while underway, as are both rudders. 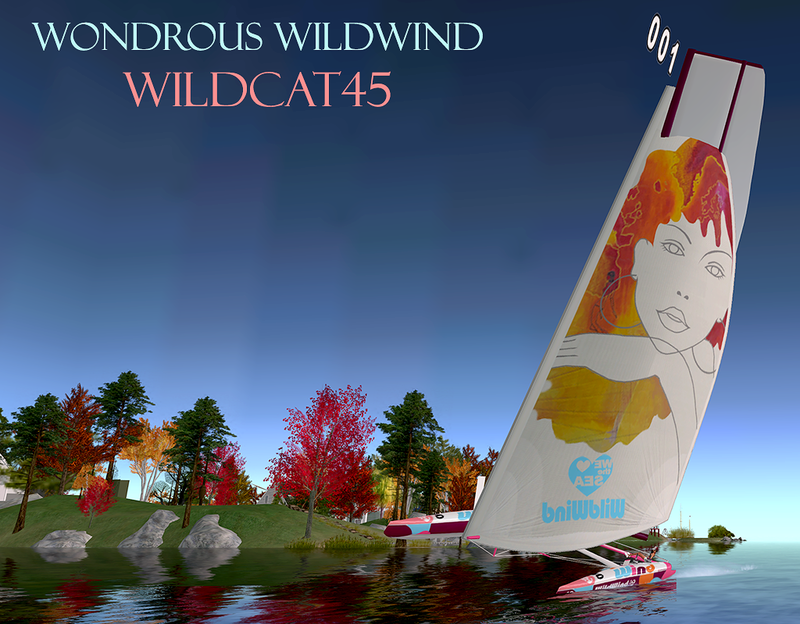 Wildcat45 does not have a mainsail; it has a hard wing instead that functions like an airplane wing. On the leach end of the wing (the trailing edge) there’s also a large adjustable panel that works to adjust lift (more on that below). In addition, the boat comes with two headsails: a normal, working jib and a much larger gennaker that provides an extra boost sailing downwind. Wildcat45 also comes with a redesigned Wildwind Control HUD with a dual column of buttons that control many standard sailing functions. However, a skipper can optionally do away with the HUD and sail the boat just with chat commands. The boat comes with two additional “Info HUDs” that provide very detailed feedback about boat speed, sail status, and wind parameters. One of the Info HUDs is for a crew member, since the Wildcat45 crew can actively switch sides on this boat to adjust heel angle and maximize speed. 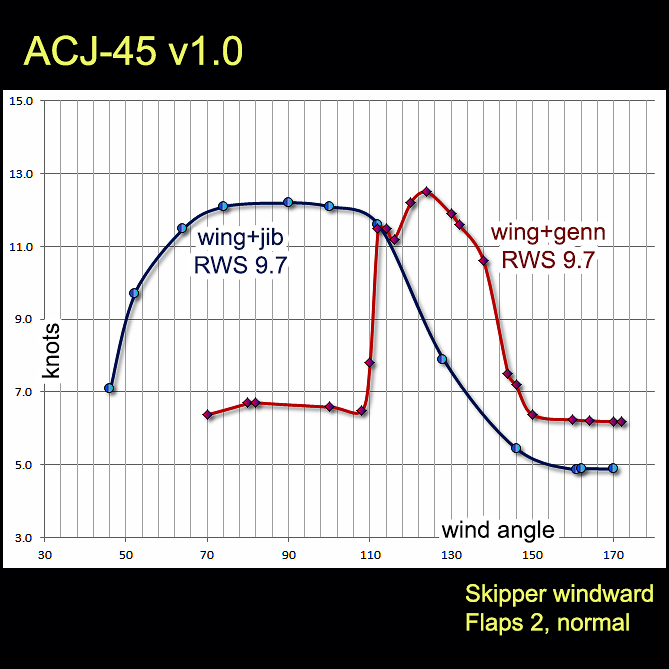 If you’re familiar with sailing Wildwind boats, and particularly if you know the ACJ-35 or ACJ-90, you’re in for a big surprise. 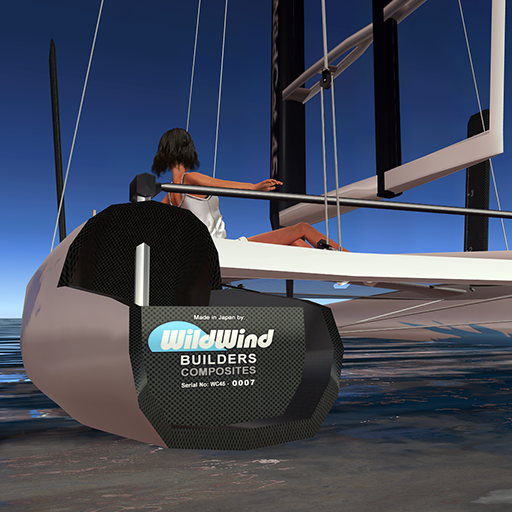 A lot has changed in the Wildwind design to make the engine and features of the boat more realistic and sheer fun to sail. First of all, Wildwind has switched to use map compass headings instead of the old draftboard compass system that was a Tako legacy. That makes life a lot more convenient! 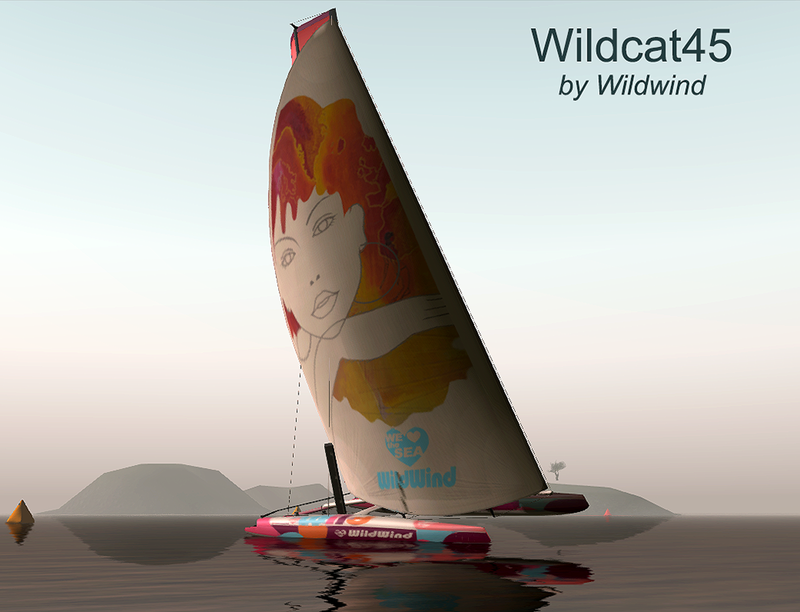 Wildcat45 has built-in boat wind, and a skipper can set the numerical wind direction and speed using chat commands. 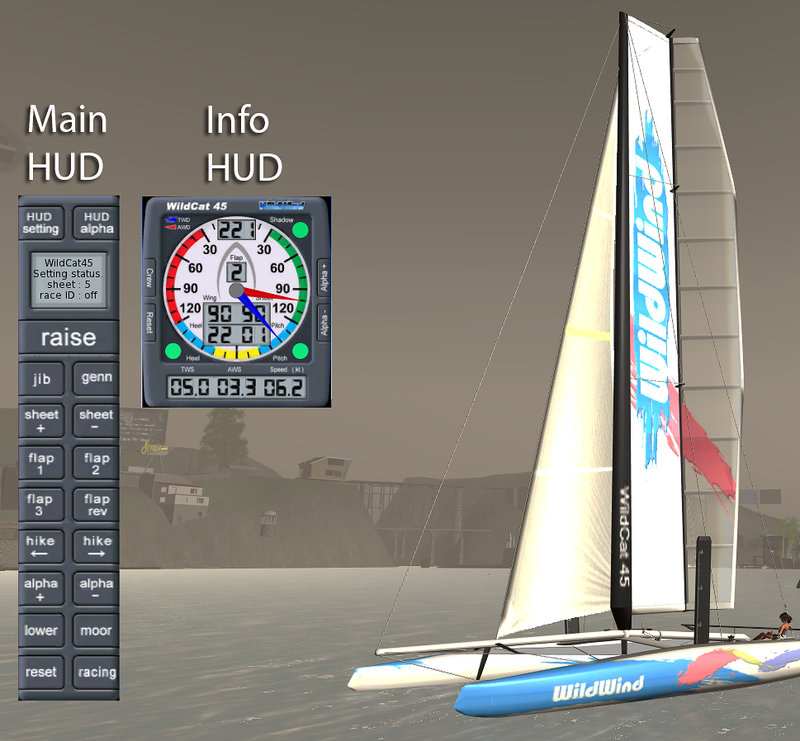 The boat has a separate racing mode that picks up cruise wind settings from a race line WWC. 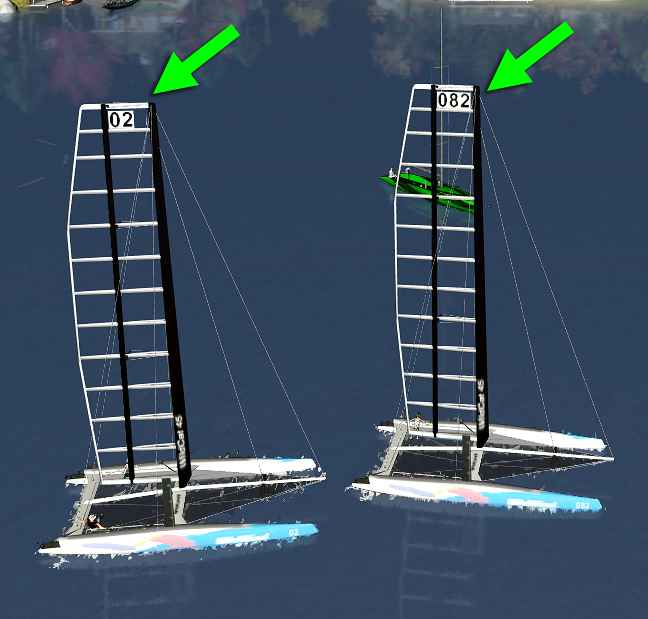 You can easily tell which boats are sailing in race mode since they automatically display the user-set race numbers at the top of the wing. The biggest and best change in the Wildwind engine is the use of full-strength apparent wind effects! 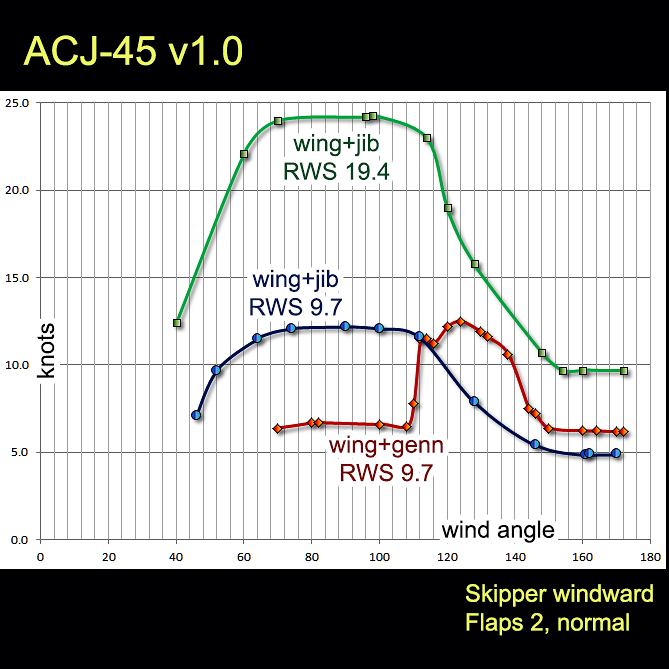 Nearly all earlier Wildwind boats used a ‘weighted’ headwind adjustment that was about one-third the real life Apparent Wind correction. 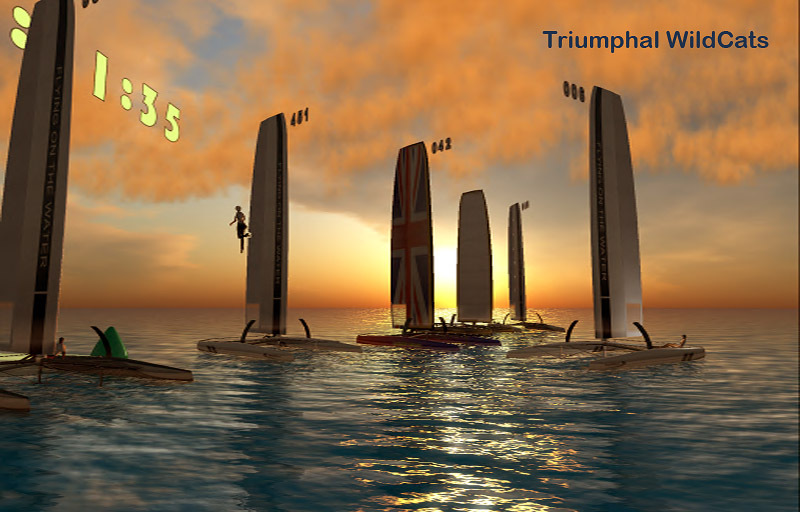 Although there were good arguments in favor of this adjustment, the use of a proprietary wind algorithm made it difficult to race the boats in a mixed fleet, and it made the boats less realistic. Well sports fans, that’s all history. 🙂 The Wildwind engine now uses the standard real-life calculations to turn real wind parameters into the apparent wind forces that drive the boat. That’s a very nice thing! Let’s talk sailing! When a skipper raises sail on a catamaran, one of the first and most important goals is to get the windward hull out of the water. Riding on one hull cuts the drag effects in half, and the boat starts to fly. You might think this is only a problem sailing upwind or on a reach, when heel effects are maximum. Well, you’d be wrong. 🙂 Ask Russell Coutts! Since heel is so important to boat speed, the Wildcat45 has a few ways for a sail team to adjust the angle. Both the skipper and crew can hike to either windward or lee positions to get the boat flying at optimal heel, and under high wind conditions it may be necessary to spill wind to keep from flipping over. The chart to the right should give you a rough idea of what to expect sailing this boat. It shows boat speed plotted against real wind angle with a constant breeze of 9.7 kn. Sailing with the jib at an upwind heading of RWA 50, the boat already exceeds real wind speed. As the boat falls away from the wind, it quickly maxes out at roughly 120-125% RWS, until the boat falls gets to a heading of RWA 110. Beyond that point the jib becomes progressively less efficient, so it’s a good time to raise the gennaker. From RWA 120°-140° the gennaker will give an extra speed boost to a maximum of 125-130% RWS. By RWA 150°, the sails are no longer providing significant lift and the boat is primarily driven by drag effects. This boat wants to fly, not be pushed, so drag effects are pretty inefficient. There is a realistic, rapid decline in performance over RWA 150° to a boat speed that’s roughly 60% RWS. If you want to check the boat out and pick one up for yourself, stop by Wildwind over in Borden, or get one at Tradewinds in Dex! This entry was posted in announcement, Far East Yacht Club, Sailboats, Wildcat45, Wildwind. Bookmark the permalink. A beautiful article of a wonderful boat. Thank you!